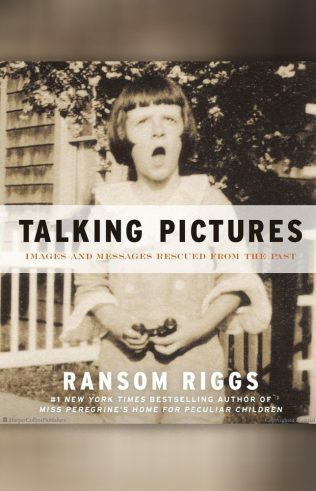 With the candid quirkiness of Awkward Family Photos and the confessional intimacy of PostSecret, Ransom Riggs’s Talking Pictures is a haunting collection of antique found photographs—with evocative inscriptions that bring these lost personal moments to life. From the author of the New York Times bestselling illustrated novel Miss Peregrine’s Home for Peculiar Children. Each image in Talking Pictures reveals a singular, frozen moment in a person’s life, be it joyful, quiet, or steeped in sorrow. Yet the book’s unique depth comes from the writing accompanying each photo: as with the caption revealing how one seemingly random snapshot of a dancing couple captured the first dance of their 40-year marriage, each successive inscription shines like a flashbulb illuminating a photograph’s particular context and lighting up our connection to the past. "I'm absolutely fascinated ... there's just enough written [on the photos] to make each image more powerful, and leave you wanting to know more." Riggs' book is not exclusively devoted to the aesthetics of the snapshot image, but rather touches on the humor, romance, drama, or tragedy of life via the accompanying handwritten text. These photos reveal something profound about our shared humanity in all its varied forms and are a poignant reminder of why we take pictures. None of us who love snapshots will ever look at them the same way again."